Carl Milton Levin (born June 28, 1934) is an American attorney and retired politician who served as a United States Senator from Michigan from 1979 to 2015. He was the chair of the Senate Committee on Armed Services and is a member of the Democratic Party. Born in Detroit, Michigan, Levin is a graduate of Swarthmore College and Harvard Law School. He worked as the General Counsel of the Michigan Civil Rights Commission from 1964 to 1967, and as a special assistant attorney general for the Michigan Attorney General's Office. Levin was elected to the Detroit City Council in 1968, serving from 1969 to 1977, and was president of the City Council from 1973 to 1977. In 1978, Levin ran for the United States Senate, defeating Republican incumbent Robert P. Griffin. Levin was re-elected in 1984, 1990, 1996, 2002 and 2008. On March 7, 2013, Levin announced that he would not seek a seventh term to the Senate. On March 9, 2015, Levin announced he was joining the Detroit-based law firm Honigman Miller Schwartz and Cohn LLP. Levin became Michigan's senior senator in 1995. He is the longest-serving senator in the state's history, and was ultimately the fourth longest-serving incumbent in the U.S. Senate. Levin was born in Detroit, and is the son of Jewish parents, Bess (née Levinson) and Saul R. Levin. Saul served on the Michigan Corrections Commission. He graduated from Detroit Central High School in 1952, and worked as a taxi driver and an auto factory worker. He attended Swarthmore College, graduating with his Bachelor of Arts in political science in 1956. He then attended Harvard Law School, where he earned his Juris Doctor in 1959. He received honorary degrees from Michigan State University in 2004, Wayne State University in 2005, and Michigan Technological University in 2008. After earning his law degree, he was admitted to the State Bar of Michigan. He entered private practice as a lawyer for Grossman, Hyman and Grossman and taught law at Wayne State University and the University of Detroit Mercy. Levin was the general counsel for the Michigan Civil Rights Commission from 1964 to 1967, where he helped form the Detroit Public Defender's Office and led the Appellate Division of that office, which has become the State Appellate Defender's Office. He served as a special assistant attorney general for the state of Michigan and chief appellate defender for the city of Detroit from 1968 to 1969. Levin was elected to the Detroit City Council (known then as the Detroit Common Council) in 1969, serving two four-year terms from 1970 to 1977. Levin served as president of the City Council throughout his entire second term, until the end of his tenure. During his time as council president, Levin became so frustrated with the U.S. Department of Housing and Urban Development's handling of repossessed houses in Detroit (leading neighborhoods to suffer from significant urban decay), that he and other members of the council, went out with a bulldozer "to help raze some of the houses." He was close to Detroit Mayor Coleman Young, the city's first African-American Mayor, and was described by Forbes as Mayor Young's "right hand man." During his time on the City Council, Levin practiced law part-time, working as a counsel for the Schlussel, Lifton, Simon, Rands and Kaufman law firm from 1971 to 1973. He later served as the general counsel at Jaffe, Snider, Raitt, Garratt and Heuer, from 1978 to 1979. Levin was elected to the United States Senate in 1978, defeating incumbent Republican Senator Robert P. Griffin. On January 22, 2013, Levin introduced the Sleeping Bear Dunes National Lakeshore Conservation and Recreation Act (S. 23; 113th Congress) into the Senate. The bill would designate as wilderness about 32,500 acres of the Sleeping Bear Dunes National Lakeshore in the state of Michigan. The newly designated lands and inland waterways would comprise the Sleeping Bear Dunes Wilderness, a new component of the National Wilderness Preservation System. Levin was formerly the chairman of the Armed Services Committee. He has served as the Democratic ranking member on the committee since January 7, 1997. Levin previously chaired the committee when the Democratic Party was the majority party in the Senate, January 3–20, 2001 and June 6, 2001 – January 6, 2003. Levin joined the Armed Services Committee upon joining the Senate. Recalling when he was assigned the committee seat, he said that he wanted to learn more about the armed services. "I had never served, and I thought there was a big gap in terms of my background and, frankly, felt it was a way of providing service." Levin believes that in order to improve the military the United States needs to shut down more installations and get rid of excess infrastructure. Under his leadership, the Committee of Armed Forces passed the Defense Base Realignment and Closure Act, which closed some military bases. Levin supported the Nunn–Lugar Cooperative Threat Reduction Program, ensuring that all nuclear, chemical and biological weapons from post-Soviet states, are secured and dismantled. Levin argued that Nunn-Lugar presented "a chance to bury the new Hitlers and Stalins of that region before they have a chance to take root." After members of the U.S. House of Representatives and then-Senator Bob Smith (R-NH) threatened to redirect funds from the Cooperative Threat Reduction Program, Levin joined a bipartisan group of senators in opposition to the 20% reduction in funding. In 2003, he voted in favor of the Nunn-Lugar Expansion Act, expanding the provisions to non-Soviet countries, and in 2005 cosponsored Senate Amendment 1030, removing congressionally imposed restrictions that delay the implementations of 2003 expansion act. In 1992, he voted to ratify the START I treaty, and for the ratification of START II in 1996, banning MIRV's and Intercontinental ballistic missiles. In 2010, Levin voted in favor of the New START Treaty, extending the original treaty until 2021 and reducing both the U.S. and Russia's deployed strategic nuclear arsenal, by almost two-thirds. In an op-ed in The Hill, Levin said that, "This treaty is a strong statement that the United States is committed to reducing the dangers to the world that nuclear weapons present. That commitment makes it easier for us to work with the international community." During the 2009 MDA/AIAA Annual Missile Defense Conference, Levin spoke in favor of the U.S.-Russian cooperation on missile defense: "Leaders in both the U.S. and Russia have recently expressed interest in exploring missile defense cooperation. Did you ever believe that some of our missile defense engineers and experts might be working together with their Russian counterparts? It could happen and if it does, it could help address a major threat. The bottom line is simple: We have a new opportunity to seek a cooperative approach with Russia on missile defense, and we should seize it. The upside potential of such an effort is huge — a geopolitical game changer. The downside is minimal." In 2014, Levin was recognized by the Jewish Community Center Association of North America with the Frank L. Weil Jewish Military Award for legislation that has benefitted Jews and other minorities serving in the military. After the 9/11 terrorist attacks, Levin voted in favor of Senate Joint Resolution 23, authorizing President George W. Bush the use of "necessary and appropriate force" against those who "planned, authorized, committed or aided" al-Qaeda and it affiliates. Levin grew critical of the Bush administration's handling of the Afghanistan War, saying in 2005 that they "took their eye off the ball when we decided to go after Iraq instead of al-Qaeda, the people who had attacked us on 9/11, and their leader. In 2008, Levin became concerned that the United States and the international community lacked a strategy for success in Afghanistan, and that NATO failed to supply troops and equipment needed in emergency situations. Levin was opposed to the 2009 Afghanistan troop surge (adding 30,000 U.S. combat troops), stressing the advancement of training and expanding the Afghan National Army; saying that the ANA should increase to 240,000 by 2012, from the original goal of 134,000, and the number of active members of the Afghan National Police should expand to 160,000, from the initial goal of 96,000. Though Levin advocated a "surge of Afghan security forces," he said that he wouldn't rule out temporarily expanding the number of combat forces, but stuck with his original position. He questioned top Obama administration officials including Secretary of State Hillary Clinton and Secretary of Defense Bob Gates during a senate hearing on the Afghanistan surge, saying that, "Where I have questions is whether the rapid deployment of a large number of U.S. combat forces, without an adequate number of Afghan security forces for our troops to partner with, serves that mission." Levin opposed setting a timetable for Afghanistan, voting against Senate Amendment 4204, requiring the President to submit a safe and orderly redeployment plan for combat troops and a plan to set a date for withdrawal, saying that, "I don't think we know enough about how these events are gonna unfold, for there to be a deadline." Levin supports the U.S. keeping a "limited footprint" in troops and in bases in Afghanistan, and has said that he will focus the remainder of his senate tenure on the "rapid transfer of responsibility for Afghan security to the Afghans." Levin was an early opponent of using U.S. military force in Iraq, saying in August 2002 that "if Saddam Hussein had weapons of mass destruction, he wouldn't use them," and that "he's a survivalist, not a suicide bomber". Levin proposed the failed Multilateral Use of Force Authorization Act, as an alternative to the Iraq Resolution, pushing President George W. Bush to build an international coalition in conjunction with the United Nations, so that "Saddam will be looking down the barrel of a gun, with the world at the other end rather than just the United States." Levin was one of 23 Senators who voted against the Iraq Resolution, saying that "If we are going to take on Saddam at some point, it is critical that we have the world with us, that there be a U.N. resolve that authorizes war, because the consequences are very, very severe. If we go without a declaration from the U.N. it is far better to have one, and that means that we've got to bring the world along here." Levin has strongly argued that the War in Iraq was a diversion from the War on Terror. On CNN on November 14, 2005, Levin said that "before the war, the President was saying that you cannot distinguish between Saddam Hussein and Iraq. As a matter of fact, he said that so often that he tried to connect Saddam Hussein with the attackers on us, on 9/11, so often, so frequently and so successfully, even though it was wrong, that the American people overwhelmingly thought, because of the President's misstatements that as a matter of fact, Saddam Hussein had participated in the attack on us on 9/11. That was a deception. That was clearly misinformation. It had a huge effect on the American people." Iraqi Prime Minister, Nouri al-Maliki, has hit back at senior U.S. politicians who have called for al-Maliki to be removed from office. He singled out Levin and Hillary Clinton, saying the Democratic senators were acting as if Iraq was "their property" and that they should "come to their senses" and "respect democracy". After the 2006 midterm elections, with the Democratic Party taking control of the Senate and Levin being reappointed as Chairman of the Senate Armed Services Committee, he was seen to have gained an influential position to oppose the Bush administration's Iraq policy, initially proposing efforts for "phased withdrawals". Though on January 10, 2007, after Bush announced intentions to send an additional 20,000 troops to Iraq, Levin said that he would support the plan if it were tied to a broader strategy of reducing the overall amount of U.S. troops; receiving opposition from his own party. In late January 2007, amid what was seen as the fiercest political battle over the Iraq strategy during the Iraq War, Levin joined a bipartisan group of senators, including then Foreign Relations Committee Chairman Joe Biden (D-DE), Susan Collins (R-ME) and Chuck Hagel (R-NE), to oppose any further escalation in Iraq; and voting in March 2007, in favor of setting a withdrawal date for U.S. forces in Iraq. 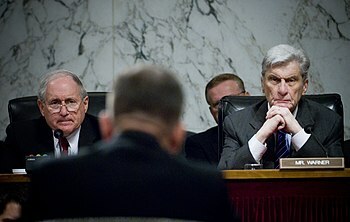 After continued criticism over the Iraq War troop surge, in August 2007, Levin and senator John Warner (R-VA), visited military bases in Mosul and Baghdad, saying that the surge brought "credible and positive results," though it failed to bring the political reconciliation needed and urged the Iraqi Parliament to hold a "no-confidence vote" on the government of Prime Minister al-Maliki. In October 2011, Levin said that President Barack Obama made the "right decision" in withdrawing U.S. troops in Iraq at the end of 2011, and not continuing a U.S. military presence. "This is not just a foreign war. They brought that war to our shores on 9/11. They are at war with us. The Supreme Court said, and I am going to read these words again, 'There is no bar to this nation's holding one of its own citizens as an enemy combatant.' "
As part of the National Defense Authorization Act for Fiscal Year 2012 (the main annual bill used to fund the US military) Levin and Senator John McCain (ranking Republican on Armed Services Committee-AZ) initially proposed to permit the indefinite detention of American citizens by the US military, without charges or trial, solely on grounds of suspected terrorist activity. After objections were raised that such detention violates Americans' constitutional rights, Levin agreed to include language (to section 1031, later 1021, of the bill) which exempted American citizens from the requirement for military detention, but not protecting them from indefinite detention. Levin has cited 'the Supreme Court' in support of his language authorizing indefinite detention (see box above). The NDAA is being challenged as unconstitutional in a lawsuit filed by Chris Hedges, Hedges v. Obama. Levin was a strong supporter of the creation of The Department of Education. Over the years, Levin has introduced legislation and amendments to improve education, including an amendment that greatly reduced class sizes to help teachers better focus on the needs of each specific child. Levin was a hesitant sponsor of the No Child Left Behind Act, and still believes that the United States Congress should examine the effects of the Act. Senator Levin has directed[when?] the Homeland Security and Governmental Affairs Permanent Subcommittee on Investigations to investigate whether Department of Energy policies have caused a rise in the price in crude oil. He also led an investigation in 2001 to try to discover the cause of the spike in gasoline prices that summer. Levin has opposed raising mandatory automobile fuel efficiency standards. Levin voted for the Energy Policy Act in 2005, a comprehensive energy bill that advanced vehicle technologies, banned drilling in the Great Lakes, improved the electrical grid of the US, and made energy efficiency a component of the United States' energy policy. Levin led opposition in the Senate to the Rahall Energy Policy Bill (H.R. 6), but lost 65–27. Levin is working to prevent garbage from Canada (typically about 160 trucks per day) from being disposed of in Michigan. Levin wrote legislation in the 2003 National Defense Authorization Act, creating a program for the research and construction of fuel-cell vehicles. In 1999, Levin obtained $56 million for the Detroit Riverfront Project. The funds will be used in part to acquire land for a major five-mile walkway and greenway along the Detroit River. The Detroit Riverfront has been contaminated for decades by pollutants from factories that once operated there. Senator Levin authored the Competition in Contracting Act, which has led to significant reductions in federal procurement costs. He also authored the Whistleblower Protection Act, which protected federal employees who expose wasteful and unnecessary practices. Senator Levin supported a Patients' Bill of Rights to reduce the ability of managed care organizations to affect medical decisions. Levin is an advocate for embryonic stem-cell research because of its potential to cure diseases like Alzheimer's, diabetes, and Parkinson's. 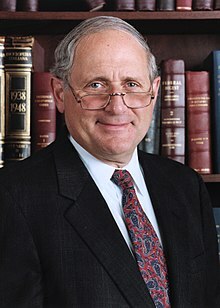 Carl Levin initiated the Stop Tax Haven Abuse Act against alleged tax havens. For the state of the initiative against tax avoidance and tax evasion registered as S.506, and the complementary initiative H.R.1265, see: Thomas (Library of Congress). Levin is a critic of the New Hampshire presidential primary's first-in-the-nation status, saying a more diverse state (such as his own Michigan) should hold its contest first. In June 1986, along with Paul Simon and John Melcher, Levin was one of three senators to oppose a tax reform bill. In November 1998, Levin attended a White House reception for National Adoption Month. In April 2006, Levin was selected by Time as one of "America's 10 Best Senators." The American Civil Liberties Union has given Levin an 84% lifetime rating on civil liberties issues. A strong gun control advocate, Levin has been graded F by Gun Owners of America. He was one of the 16 senators who voted against the Vitter Amendment. He is almost always seen wearing his glasses at the end of his nose, which has drawn much humorous attention. In response, he lightheartedly joked that the late Senator Strom Thurmond (while he was in office) would have never worn his glasses because they "make him look old." Daily Show host Jon Stewart refers to him both as the "kindly old shoemaker", and "Grandpa Munster". An avid supporter of the non-profit civil rights organization Focus: HOPE, Levin was instrumental in the procurement of equipment and funding for their Machinist Training Institute (MTI). Levin was first elected to the U.S. Senate in 1978, defeating Senate Minority Whip Robert P. Griffin. Levin faced a tough reelection bid in 1984 against former astronaut Jack R. Lousma, winning by only four percent. However, he routed Congressman Bill Schuette in 1990, and was reelected in 1996 and 2002 against only nominal Republican opposition. In 2002, Levin garnered 61% of the vote against Republican Andrew "Rocky" Raczkowski despite the then-high popularity of President George W. Bush and the GOP and a close gubernatorial race that year. In the 2008 election Levin won by a comfortable margin against state representative Jack Hoogendyk. Carl Levin married Barbara Halpern in 1961 and they have three daughters: Kate, Laura, and Erica. Levin's family has long been active in Michigan politics. His older brother, Sander Levin, has represented Michigan's 12th congressional district in the House of Representatives from 1983 to 2019. Sandy's son (Carl's nephew) Andy Levin was a policy analyst for the AFL-CIO, and was elected in 2018 to the United States House of Representatives, succeeding his retiring father. Carl's uncle Theodore Levin, was a chief judge on the U.S. District Court for the Eastern District of Michigan. Carl's first cousin Charles Levin was a Michigan Supreme Court judge; another first cousin, Joseph Levin, was a candidate for the House. In 2004 He received the Honorary degree of Doctor of Laws from Oakland University. In 2007 he received the Freedom medal. In 2016, USS Carl M. Levin (DDG-120), an Arleigh Burke-class destroyer was named in his honor. ^ a b Cameron Joseph (March 7, 2013). "Levin retirement leaves Dems defending fourth open seat in 2014 cycle". thehill.com. ^ "Former U.S. Sen. Carl Levin joins Detroit law firm". Detroit Free Press. 2015-03-09. Retrieved 2017-05-19. ^ "Carl Levin". New York: Nydailynews.com. Archived from the original on 2010-05-29. Retrieved 2010-05-27. ^ "1 Rootsweb.com". Freepages.genealogy.rootsweb.com. 1934-06-28. Retrieved 2010-05-27. ^ Todd Spangler (March 8, 2013). "U.S. Sen. Carl Levin won't run for seventh term". Detroit Free Press. ^ Associated Press (March 8, 2013). "Race for Carl Levin's seat wide open after his decision not to run". AnnArbor.com. Archived from the original on 2013-03-13. ^ Ken Thomas (March 8, 2013). "Sen. Carl Levin's decision opens seat in 2014". businessweek.com. Archived from the original on April 10, 2013. ^ Bowdoin College (March 13, 2013). "Interview with Carl Levin by Brien Williams". digitalcommons.bowdoin.edu. ^ "Carl Levin — U.S. Senator from Michigan". Levin.senate.gov. Archived from the original on 2010-05-27. Retrieved 2010-05-27. ^ Gerald S. Greenberg. Historical Encyclopedia of United States Independent Counsel Investigations. Greenwood Publishing Group. Retrieved March 14, 2013. ^ "THE HONORABLE CARL M. LEVIN U.S. Senator State of Michigan". nationalsummit.org. March 14, 2013. ^ Ken Thomas (March 7, 2013). "Sen. Carl Levin's decision opens seat in 2014". miamiherald.com. ^ San Francisco Chronicle (March 8, 2013). "Sen. Carl Levin's decision opens seat in 2014". sfgate.com. ^ Spyridon Mitsotakis (January 13, 2013). "Detroit Betrayed: The Radical Wrecking Of An Iconic City". forbes.com. ^ United States Government Printing Office (March 15, 2013). "Congressional Directory for the 112th Congress (2011-2012), December 2011". gpo.gov. ^ "S. 23 - Summary". United States Congress. Retrieved 3 March 2014. ^ "CBO - S. 23". United States Congress. Retrieved 3 March 2014. ^ "Committee Membership List This report lists the current members of all Senate Committees as of the previous day". senate.gov. March 16, 2013. ^ Joe Magid (March 16, 2013). "In Their Own words Congressman Sander Levin and Senator Carl Levin". Philadelphia Jewish Voice. ^ National Archives and Records Administration (March 16, 2013). "Committee Resource Guide: Committees of the U.S. Senate". archives.gov. ^ "Chairman Offers Tough Scrutiny of Military". Roll Call. 2010-05-24. Retrieved 2010-08-29. ^ "Pentagon's future fighter aircraft doubles in cost". CNN. March 12, 2010. ^ Paul I. Bernstein, Jason D. Wood (April 2010). "The Origins of Nunn-Lugar and Cooperative Threat Reduction" (PDF). National Defense University. Archived from the original (PDF) on 2013-03-03. ^ Jason Ellis, Todd Perry (October 1997). "Nunn Lugar's Unfinished Agenda Journal Article, Arms Control Today, volume 27, issue 7, pages 14-22". harvard.edu. ^ THOMAS Library of Congress (July 21, 2005). "Bill Summary & Status 109th Congress (2005 - 2006) S.AMDT.1380". thomas.loc.gov. Archived from the original on 2012-12-15. Retrieved 2013-03-17. ^ "U.S. Senate Roll Call Votes 102nd Congress - 2nd Session Definitions; Protocols on Conversion or Elimination, Inspection, Notification, Throw-weight, Telemetry, and Joint Compliance and Inspection Commission; and Memorandum of Understanding; all integral parts of the START Treaty". senate.gov. October 1, 1992. ^ "U.S. Senate Roll Call Votes 104th Congress - 2nd Session The Treaty Between the United States of America and the Russian Federation on Further Reduction and Limitation of Strategic Offensive Arms (the START II Treaty) signed at Moscow on January 3, 1993, including the following documents, which are integral parts thereof: the Elimination and Conversion Protocol; the Exhibitions and Inspections Protocol; and the Memorandum of Attribution". senate.gov. January 26, 1996. ^ "Senate Vote 298 - Final Passage for Arms Treaty". The New York Times. December 22, 2010. Archived from the original on March 6, 2013. ^ Michael E. O'Hanlon. "New START Shouldn't Be Stopped". Brookings Institution. ^ Carl Levin (July 12, 2010). "New START treaty makes us safer today and tomorrow (Sen. Carl Levin)". thehill.com. ^ "Sen. Carl Levin (D)". National Journal Almanac. Archived from the original on 18 June 2013. Retrieved 15 August 2014. ^ "U.S. Senate Roll Call Votes 107th Congress - 1st Session On the Joint Resolution (S.J. Res. 23 )". senate.gov. March 16, 2012. Retrieved September 14, 2001. ^ "Democrats rip failure to find bin Laden". cnn.com. April 23, 2006. Archived from the original on April 10, 2013. ^ Elana Schor (March 7, 2008). "Congress demands testimony from Nato commander in Afghanistan". guardian.co.uk. ^ "Report of Senator Carl Levin (D-MI) and Senator Bob Casey (D-PA)Travel to Pakistan and Afghanistan". levin.senate.gov. June 3, 2008. Archived from the original on 2013-02-14. ^ Josh Rogin (September 16, 2009). "The Obama administration's draft metrics on "evaluating progress in Afghanistan and Pakistan"". Foreign Policy Magazine. ^ Eric Schmitt, David E. Sanger (September 10, 2009). "Obama Faces Doubts From Democrats on Afghanistan". The New York Times. ^ Jay Newton-Small (September 14, 2009). "Congressional Dems Get Balky on Afghanistan". Time. ^ Elizabeth Bumiller (December 2, 2009). "Obama Team Defends Policy on Afghanistan". The New York Times. ^ "U.S. Senate Roll Call Votes 111th Congress - 2nd Session On the Amendment (Feingold Amdt. No. 4204 )". senate.gov. May 27, 2010. ^ "CQ Transcript: Sens. Levin, Graham on NBC's 'Meet the Press'". rollcall.com. October 11, 2009. ^ Carlo Muñoz (December 6, 2012). "Lawmakers push to station remaining US troops at Afghan bases after 2014". thehill.com. Archived from the original on April 11, 2013. ^ British Broadcasting Corporation (August 12, 2002). "US opposition to Iraq attack grows". bbc.co.uk. ^ Lincoln Chafee (March 1, 2007). "The Senate's Forgotten Iraq Choice". The New York Times. ^ Alison Mitchell, Carl Hulse (October 11, 2002). "THREATS AND RESPONSES: THE VOTE; CONGRESS AUTHORIZES BUSH TO USE FORCE AGAINST IRAQ, CREATING A BROAD MANDATE". The New York Times. ^ "Senate Roll Call: Iraq Resolution". washingtonpost.com. October 11, 2002. ^ PBS NewsHour (December 10, 2012). "Senators Richard Lugar and Carl Levin Discuss Next Moves in Iraq". pbs.org. ^ "Setting the Record Straight: Sen. Levin On Iraq". whitehouse.archives.gov. November 14, 2005. ^ "Iraq PM to U.S. lawmakers: Stay out of our politics". cnn.com. August 27, 2007. ^ "Maliki returns fire at US critics". BBC News. 2007-08-26. Retrieved 2010-05-27. ^ Michael Abramowitz, Thomas E. Ricks (October 20, 2006). "Major Change Expected In Strategy for Iraq War". The Washington Post. ^ Steve Inskeep (November 14, 2006). "Levin: U.S. Pullout Would Force Iraq Political Solution". npr.org. ^ Jeff Zeleny (January 4, 2007). "Awaiting Bush's Iraq Plan, Democrats Weigh Replies". The New York Times. ^ "GOP senator drafting alternative war resolution". cnn.com. January 18, 2007. ^ Jeff Zeleny, Carl Hulse (March 28, 2007). "Senate Supports a Pullout Date in Iraq War Bill". The New York Times. ^ Todd Spangler. "Levin: Troop surge has 'positive results' in Iraq But he doubts military success can end the bloodshed". Detroit Free Press. ^ Lindsey Ellerson (August 20, 2007). "Success of the Surge?". abcnews.go.com. ^ "Levin Statement on President's Decision to Withdraw Troops from Iraq". levin.senate.gov. October 21, 2011. Archived from the original on 2013-02-17. ^ "Hamdi vs. Rumsfeld". caselaw.lp.findlaw.com. June 28, 2004. ^ Knickerbocker, Brad, "Guantánamo for US citizens? Senate bill raises questions," The Christian Science Monitor, 3 December 2011: . ^ Barett, Ted (December 2, 2011). "Senate passes defense bill with detainee policy compromise". cnn.com. ^ Lithwick, Dahlia. "Military Police State". slate.com. ^ Katz, Basil (14 September 2012). "REFILE-U.S. calls ruling on military detention law harmful". Reuters. Retrieved 16 September 2012. ^ York, Anthony (2002-03-14). "Salon.com". Dir.salon.com. Archived from the original on 2008-05-21. Retrieved 2010-05-27. ^ "Offshore Tax Bill" (PDF). Archived from the original (PDF) on 2010-05-27. Retrieved 2010-05-27. ^ "Portail d'informations Bank Julius Baer". Wikileaks.org. Archived from the original on November 5, 2009. Retrieved 2010-05-27. ^ "The 97-3 vote by which the Senate approved the..." UPI. June 25, 1986. ^ Clinton, Bill (November 24, 1998). "Remarks at a National Adoption Month Reception". Public Papers of the Presidents of the United States. ^ "Time.com". Time.com. April 14, 2006. Retrieved 2010-05-27. ^ "USAtoday.com". Asp.usatoday.com. 2004-04-16. Archived from the original on 2008-05-21. Retrieved 2010-05-27. ^ "Carl M. Levin (D-Mich.) – WhoRunsGov.com/The Washington Post". Whorunsgov.com. 2010-04-28. Archived from the original on 2010-02-05. Retrieved 2010-05-27. ^ "Detnews.com". Detnews.com. Retrieved 2010-05-27. ^ Michigan's Secretary of State Office. "MICHIGAN DEPARTMENT OF STATE Election Results GENERAL ELECTION November 04, 2008". miboecfr.nictusa.com. Archived from the original on 2013-06-19. ^ Johnson, Ruth (December 17, 2002). "Election Results: GENERAL ELECTION - November 05, 2002 (United States Senator 6 Year Term (1) Position)". Michigan Department of State. Archived from the original on March 18, 2013. ^ Parker, Randy; Hingle McCringleberry (July 16, 2007). "Our Campaigns: MI U.S. Senate". Our Campaigns. ^ Parker, Randy; crickets chirp (July 7, 2003). "Our Campaigns: MI U.S. Senate". Our Campaigns. ^ "Honorary Degree". oakland.edu. Retrieved 2018-08-13. ^ gdadmtm (2016-03-31). "Navy Awards General Dynamics Bath Iron Works $644 Million for Construction of DDG 51 Class Destroyer". General Dynamics. Retrieved 2018-08-13. 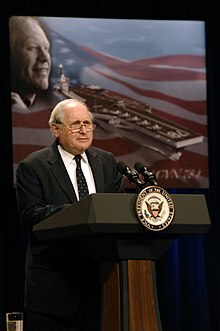 Wikimedia Commons has media related to Carl Levin. This page was last edited on 22 April 2019, at 02:52 (UTC).